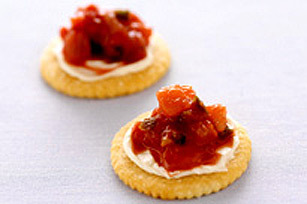 Cream cheese and salsa turn crackers into fiesta-worthy snacks for under 100 calories per serving. Spread each cracker with 1/2 tsp. cream cheese; top each with 1 tsp. of the salsa. Serve immediately. Top salsa with sliced black olives or jalapeno pepper slices for a tasty twist.